Let’s get this out of the way first. Dental implants can become infected. This is called “peri implantitis”. The symptoms of peri implantitis are quite similar to gum disease and other oral bacteria infections, and are usually caused by bacteria which get underneath the gum on to the implant surface, and attack the underlying jaw structure. It can cause implant failure, as well as damage to the jaw bone and soft tissues of the gums, and more. An infected dental implant is a serious problem, and must be addressed by a skilled periodontist and implant surgeon, if it progresses without treatment. This sounds scary – but there’s good news. In those patients who keep their mouths clean, the risk of a dental implant becoming infected is extremely low. Chances are, the vast majority of dental patients who perform good oral hygiene will never have to worry about this issue. What Happens If A Dental Implant Becomes Infected? Bacterial decontamination and debridement – Usually, this is used in concert with other treatments, such as mouthwashes. Using surgical tools, or a variety of other precise tools, dead tissue can be removed from the area around the dental implant. Then, the area can be disinfected. After this, the gum will regenerate to health on its own. In more extreme cases of peri implantitis, gum and bone grafting may be required to ensure the continued health of the dental implant. Antibiotics and antibacterial rinses are sometimes used after removal of dead tissue, to prevent re-infection. 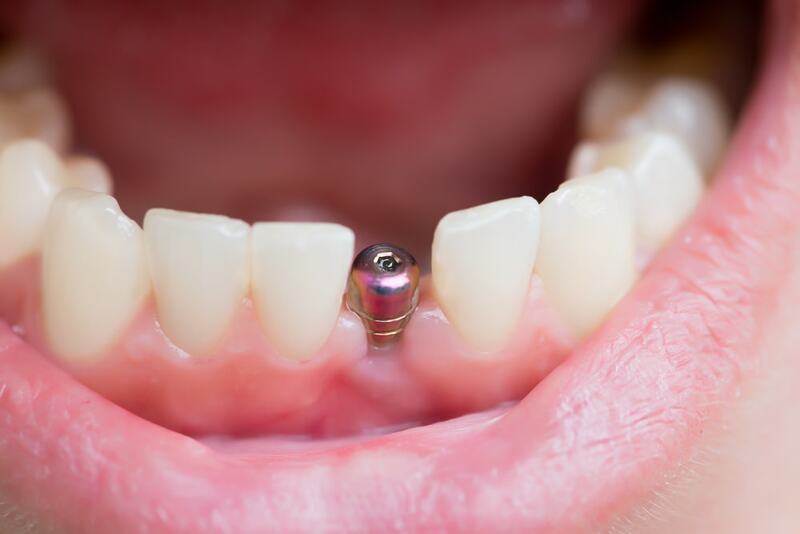 In extreme cases, the entire implant may be surgically removed, but this is very rare, and only done if the implant poses a threat to the surrounding natural teeth, or is significantly deteriorated. Want to make sure that you minimize your own risk of peri implantitis? Here are our top tips! Partner with an experienced implant dentist – Preventing dental infection starts with the initial surgery. Make sure that you choose an experienced implant dentist, with a proven history of successful dental implants. Follow all post-operative and recovery instructions – For many people, infected dental implants are a problem because they did not follow the doctor’s instructions for recovery. In most cases, your doctor will prescribe a regimen of antibiotics that should be used after surgery, in order to reduce the risk of infection. Make sure to follow these instructions.In addition, use antibacterial mouthwash as directed by your dentist, avoid touching the implant or moving it, and don’t eat hot liquids or foods. Follow all other instructions that your dentist may give you. Maintain proper oral hygiene – Your dental implant is like a natural tooth, in just about every way! This means that, if you neglect to brush your teeth properly, fail to floss, or otherwise fail to maintain a proper oral hygiene regimen, your risk of a tooth infection will increase.To fight back against peri implantitis, make sure that you brush and floss at least 2-3x a day, preferably after meals. Don’t skip your six-month oral exams or follow up appointments – The best way to fight back against peri implantitis is to catch it when it’s still a minor issue. And the only way to tell if your implant may be infected is to see your doctor for your regular oral hygiene exams, and for follow-up appointments after your implant has been placed.If you catch an oral infection early, it can easily be treated by simply brushing and flossing more carefully. But if the infection progresses, it’s much more difficult to treat. Understand infection risk factors like smoking, diabetes, and previous cases of gum disease – Some implant dentists will outright refuse to operate on smokers. This is because smoking is the #1 cause of premature dental implant failure.Smoking increases the risk of tooth infections, periodontal disease, and oral bacterial growth. It also has a negative effect on the mouth’s natural ability to heal, and fight back against infection. If you’re a smoker and you have a dental implant, stop now – or you may get peri implantitis.Diabetes is another primary cause of dental implant infection. High blood sugar can cause increased bacterial activity on the gums – and this can lead to infection of a dental implant. Make sure your diabetes is properly controlled to avoid dental infection. Interested In Dental Implants? Get The Facts At Central Periodontics! At Central Periodontics, Dr. Bikram Sethi provides the best dental implants in Canberra City. With years of experience and a friendly, informative approach to implant dentistry, he can help you understand the process of receiving a dental implant – and whether or not it’s right for you. So if you want to know more about dental implants and how to minimize the risk of dental infection, contact us right away and schedule an appointment! We look forward to seeing you soon.